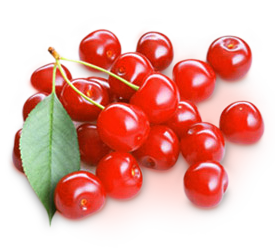 Ontario's red tart cherries are the world-renowned Montmorency variety, the best cherries for pies, sauces, tarts, jams and desserts. In July, at the height of their availability, Ontario red tart cherries are pitted, chilled and packed to order daily in 5 kg (11 lb) pails with 10% sugar added. The cherries are also available with no sugar added (ask your supplier for details). Ontario black sweet cherries are available in 4.5 kg (10 lb) pails.